This traditional radiator combines authentic, classic styling with function, a must for all traditional bathrooms. Our range of traditional radiators are great for finishing off classic bathroom. Co-ordinate with our classic taps and showers to recreate the charm of yesteryear. Quality steel tubing incorporating a period style column radiator. Ideal for use in the bathroom kitchen cloakrooms etc. Supplied with a pair of quality traditional chrome radiator valves. The Savoy traditional radiator offers the perfect balance of stunning design and incredible build. It is ideal for any bathroom looking for both style and functionality, as it takes influences from classical radiator designs and incorporates modern engineering and manufacturing capabilities. Ideal for heating towels as well as heating your bathroom. Q. What is the heat otput of this model? Q. Is this a true white? Hi Melanie. Due to the nature of the enamelling, this isn't bright 100% white, normally it is just on white, but to suit the traditional look, it is slightly darker. They always look great though! Hi, I'm not really sure of your question you may wish to seek the advise of a local plumber. Hope this helps! Q. can the valve accept the feed pipes if they come throught the wall rather than verticle from the floor? 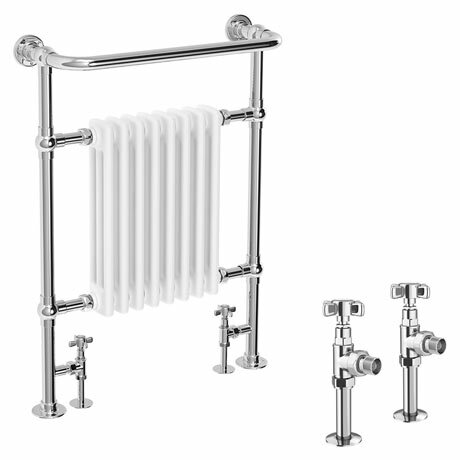 Hi, this would be possible with the Premier Savoy Traditional Radiator with Angled Crosshead Valves. The valves would have to be tightened so they were facing the wall instead of the floor like in the picture on our site. Thanks. Q. Where is the bleed valve? The bleed valve here is located in the top left corner, on the chrome section. Hi Robin. Please give us a call on the number at the top of the page and we'll see if this is possible for you. "Really good looking radiator, good quality, better than expected." Lovely item. Would buy again. Good service. Looks good nice and very good quality. Quality radiators and valves at a comparative price. On time delivery. "This is an awesome radiator, top quality." "Packaged well, styled as I needed. Not yet fitted." "Stylish, functional and good value." I was looking for an elegant radiator for my bathroom, that gave out a more than adequate heat and looked like my other radiators and also functional. This rad ticks all my requirements the cross head valves looks so unusual and stunning. The bleed valve is on the top right underside. A truly impressive piece. The only down side was delivery from UPS (UPS London, your area of the UK may have a better service in your area) who didn't deliver on the date paid for Saturday but Victorian Plumbing gave me a full refund on my delivery cost. Which I appreciate. The sale was 2 hours to go, I needed a feature radiator and this was incredible value so i rushed to order. I went to bed woke up and thought this was a mistake the set could not be any good at this price and thought I would have not wasted to much money.I was totally surprised it arrived with two other item, I will write a review on them later, on a pallet very quickly. The quality was amazing I cannot believe how good it was. Recommend, absolutely both Victorian Plumbing and this radiator. Super product. Good solid radiator. Gives off good heat in a moderate sized bathroom with single glazing and high sealings. Very good delivery service. Would definitely recommend.